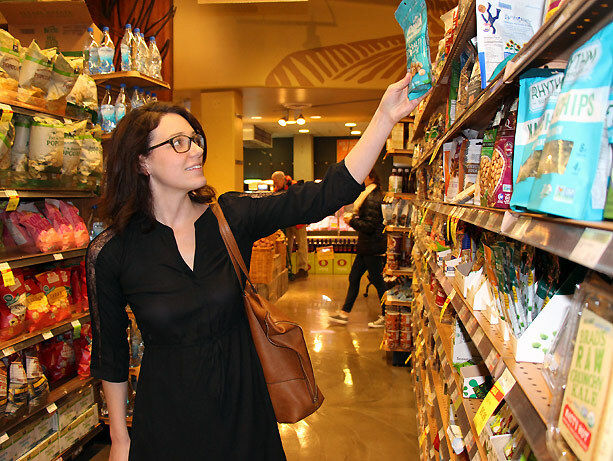 Jamie Bachaus checks out a product on the snack aisle in Whole Foods. A growing number of cities in the United States are raising the minimum wage in an effort to improve the well-being of low-wage workers, but few studies have looked at the public health implications of these policies, including effects on food security, diet quality, and associated health outcomes. This is the first study of the effects of a minimum wage policy this size, and at the local level, on supermarket prices in real-time. In Seattle, large employers, such as grocery retailers, were required to pay workers at least $11 an hour starting in April 2015, $13 an hour in January 2016, and $15 an hour in January 2017. The study was funded the City of Seattle and the Laura and John Arnold Foundation. It is part of ongoing work of the UW Minimum Wage Study Team. Analysis of supermarket food prices collected after the Seattle policy increased to $15 per hour is forthcoming. Otten, along with Heather Hill of the Daniel J. Evans School of Public Policy and Governance and James Buszkiewicz, a doctoral student in epidemiology, are also examining the links between minimum wage and health outcomes over time.